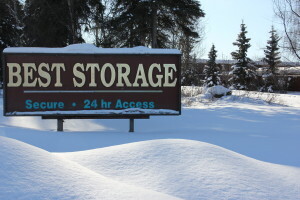 December 2013 - Best Self Storage in Anchorage! Over the holidays our homes often begin feeling a little crowded with house guests, children home for the holidays, and friends coming over. A family room may have to double as an extra bedroom. A living room may suddenly be taken up with a Christmas tree and presents. Best Storage is glad to offer a few tips to help you find more space for family and friends. 1. Rethink how your family room is organized. Chairs and sofas are often directed toward a TV – which is fine most of the year. But when entertaining family and friends, conversation is important. Consider setting furniture around a coffee table to help guests visit easily. 2. Increase seating. Can you bring chairs in from the garage or basement? Borrow a sofa from the den? Arrange your living area so that all your guests can be comfortably seated at once. 3. Try removing unnecessary furniture. If you’re adding chairs and end tables (not to mention presents and trees), something is going to have to go. Eliminate bulky items and anything that blocks easy movement around your home. 4. Guests staying overnight will be bringing coats and suitcases, so try to make some extra room for them. Be sure there’s easy access to bathrooms and to outlets so people can charge their phones. We can fix you up with an extra storage room over the holidays. No need for a long term rental. It’s just $29.95 to move in for a month – with no obligation to stay longer. To help you store things that might be getting in the way, we’ll have our truck and driver come by to help you at no charge. If you don’t need extra space after the holidays, just move out. Or, you might want to keep a little space to store lights, decorations, and other Christmas things until the next year.